Located with in walking distance to the town of Dominical is this comfortable 3-bedroom 2 bath home. It is set high above the Rio Baru and surrounded by large tracks of rain forest teaming with local wild life. You will be able to enjoy the sound of the river at night and awake to the howler monkeys at dawn. Dominical is just 3 minutes by car or just walk or ride your bike into town. This home is made of solid concrete block construction and is ready to be lived in now. The rooms are spacious and there is poetical to expand. It’s in ideal location to be used as a vacation rental, for the buyer that is looking to enjoy the Dominical area part time and see rental income when they are not here. The Rio Baru is just 500 meters below and offers year around enjoyment, with the best swimming holes just a minute or 2 from the house. 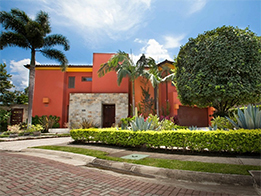 It is located in an ideal position being just 3 minutes from the coast highway and access to the neighboring towns of Uvita and San Isidro De General. This is a great opportunity to plug into the Dominical community. Email or call to set timings to see this home. It wont last long!